Art and functionality converge in WAC Project, a new line of designer lamps created in collaboration between Woodamp and artists from Artevistas Gallery. Founded by couple Fran and Jésica, Woodamp takes design back to basics with beautifully-crafted lamps made from untreated wood. 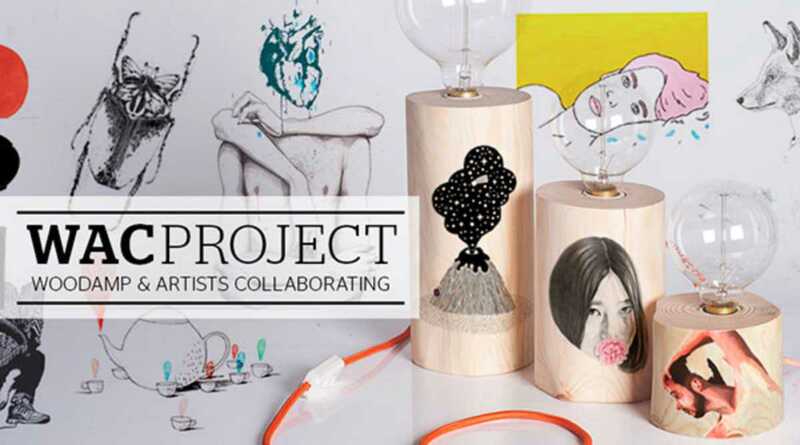 Now, their usually simplistic pieces have been given a splash of color by twelve renowned and very different artists, each bringing their distinct style to the project through the use of techniques including illustration, painting and engraving. Among the collection you’ll find an aquarium scene in the typically vivid colors of Sanz i Vila, the borderline surreal characters of Lantomo, and charming illustrations of volcanos floating in the sea by Cane, all of whom have recently exhibited at Artevistas. Function hasn’t been compromised, but the artistic contribution has turned these gorgeous lamps into works of art in their own right. Whether you’re shopping or not, admire their creators’ vision and craftsmanship at Artevistas Gallery this month.